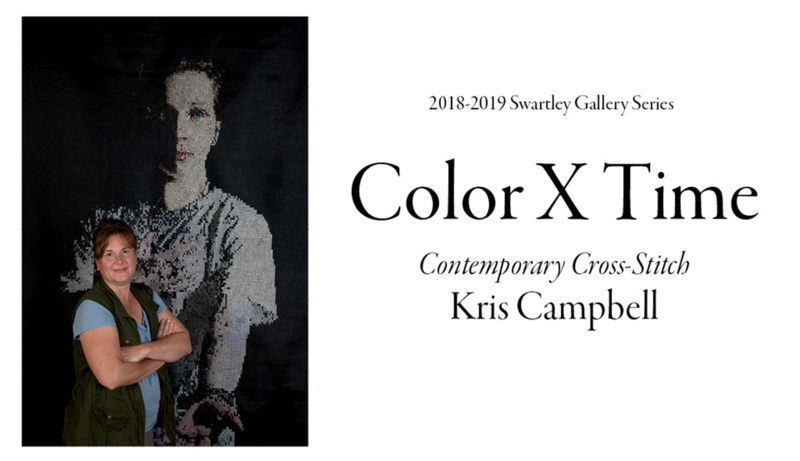 Kris Campbell is currently creating large scale portrait art using cross stitch technique on open weave synthetic screens for canvas. Kris double majored in both Art and Biology at Lafayette College. Her early path after undergraduate school lead her to a position of color manipulation in the world of clothing catalog publishing, back when Photoshop was just 1.0 version! Whether employed full-time or part-time, Kris always maintained a studio space to create. Her desire for community connection lead her to working for Social Impact Studios, a Philadelphia based business that brought art and activism together to engage the public in important social issues. She continued to paint and sculpt in Philadelphia while not only working full-time but also studying at the original renowned Barnes Museum. Never willing to sit still in life, Kris persistently pursued acceptance to the SVA graduate school program. Upon acceptance into the MFA program, Kris left Philadelphia and returned to New York. Here her work continued, painting portraits on plexiglass while experimenting with layering techniques of both color and plexi. Kris’ art has been deeply influenced by the generations of familial history in the flower bulb industry. It shines brightest in how she sees color, explaining that each cross-X in her stitching is like an individual bloom in the Dutch flower fields. Kris inherited a vast supply of fiber art supplies upon the death of her grandmother. Bequeathed heirloom supplies and equipment (looms, spinning wheels, wool, and boxes of embroidery floss) guided her to her first cross stitch project which was a portrait of her son. Upon completion, she chose to frame the piece with the back as the front. Flashing forward 10 years now, she is using window screen as a ground, enabling her to work bigger and play more with color. In the past year the work has come off the wall and hangs so that both sides of the work can be experienced, making her newest art a sculptural experience, too. Kris Campbell is currently represented by 95 ½ MAIN Gallery in Nyack, NY. A structured involvement in the arts unleashes the kind of creativity that can invigorate one’s entire learning experience. Studying the arts can also help a student grasp mathematical and visual concepts, develop critical literacy, and see patterns across academic disciplines. At Dwight-Englewood, the arts play an important role from pre-kindergarten through the 12th grade. All Lower School students learn how to listen to and create music. One activity that defines the Lower School experience is the Creating Original Opera program, in which all fifth-graders participate. Additionally, our studio-art program offers children the opportunity to explore many forms of visual art. Students work from both their own imagination and direct observation. By starting out early in life making art, our students ignite a lifelong love for the arts. At the Middle School level, drama, music, and studio art challenge students to become confident and imaginative innovators. This growth continues in the Upper School, where a program such as Jazz Rock helps aspiring singers and musicians select the right composition to show-case their talents. In the Upper School, students can choose from courses in studio art, sculpture, ceramics, and photography/video production; theater courses that explore acting technique, writing for the stage, production, and the technical arts; and music courses in orchestra and chamber ensembles, chorus, stage band, or handbell choir. One of the most exciting things about Dwight-Englewood’s arts program is that so many of our instructors boast significant professional experience. Many are active on Broadway, play in musical ensembles, or pursue visual-arts careers. By sharing their real-world experience with students, our teachers serve to inspire and to prepare a new guard made up both of people who make art and those who deeply appreciate it. New York Academy of Art - M.F.A. Rhode Island School of Design - B.F.A. University of Pennsylvania - B.A. Long Island University - B.A. Join us for Dwight-Englewood School's production of CATS!